What Small Business Idea Can Be Your American Dream? You’ve probably said to yourself, “I had that idea, but they were the ones who made a business out of it!” Every day, optimistic entrepreneurs are inventing the future. They do it in the good and the bad economic times. Instead of worrying about THE economy; they get busy creating their own. If you can give people something they need bigger, better, faster or cheaper, people will pay for your solution. Instead of just sending around resumes to find a job, have you considered investing some of your time in turning your gifts into small business you can own. The American Dream is not dead; it is very much alive. If this peaks your interest, I want to let you know about a new resource I just found, Jim Blasingame’s radio show and website, http://www.smallbusinessadvocate.com. His nationally syndicated radio program is one of the top rated business shows in America. You can start by listening in to my interview this morning on my book, The Optimism Advantage. We focused on building a track record of overcoming obstacles as a platform for earned optimism. When you’ve overcome obstacles in the past, that builds your confidence to overcome the next one. That’s what makes an entrepreneur–they have the persistence and the passion to make things happen. They don’t wait for success; they invent the future. As a small business leader, they know their job is to keep hope alive for their team. They draw on stories of past successes to rally their motivation to become the next successful chapter in a very positive soap opera called…their own small business. If you think loans and opportunity are not out there, you are wrong. 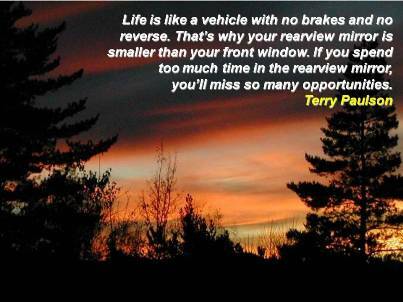 Get out of the rearview mirror and into the front window of opportunity to find your place in the future. The American Dream isn’t given to you. You earn it. Use this blog and resources like the Jim Blasingame’s small business advocate website to give you the guidance, knowledge and confidence to optimistically claim your own American Dream. What are you waiting for? Get started investing some of your time in your dream today.